It was exactly a year ago that Beck Hansen, the artist professionally known as simply Beck, was set to open for U2 at the Edward Jones Dome in St. Louis, when that show was abruptly canceled amid heavy protests related to the Jason Stockley verdict. At the Fox Theatre Sunday evening, Beck noted the anniversary, saying, "We're gonna make good on that tonight." At 48, Beck has vastly grown and evolved since breaking out with the hit "Loser" from his major label debut, "Mellow Gold," more than 20 years ago, emerging as an alt-rock geek hero. His style continued to morph over subsequent albums – some more well received than others – finally getting his well-earned due again with the staggering success of 2014's "Morning Phase," which beat out favorite Beyonce to win the coveted Album of the Year Grammy, as well as Best Rock Album the following year. If "Morning Phase" was Beck's most mature and contemplative album yet, its follow up, 2017's "Colors," was a return to his earlier, more playful, danceable style – a self-described "bright, shiny, happy kind of record." The "Colors" tour lived up to its name, both visually and audibly. An artist in the truest sense of the word, Beck and his stellar band offered a fully immersive 90-minutes of career-spanning music set to stunning video graphics, lasers and lights. 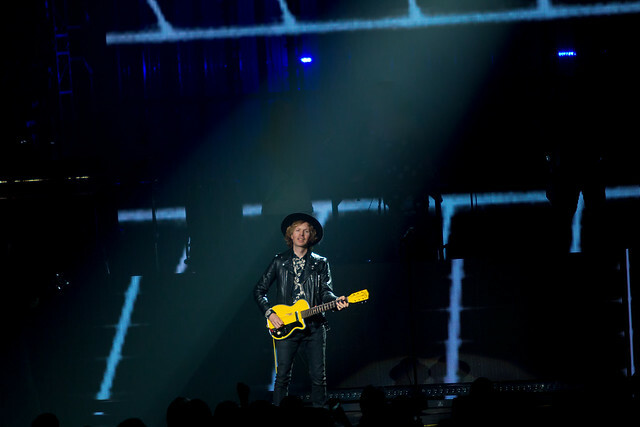 Entering to cheers wearing a black hat and black leather jacket and wielding a bright yellow guitar, Beck and his band (dressed to match in various black-and-white outfits) kicked off with a classic, "Devil's Haircut," after which he greeted the crowd with an enthusiastic "Odelay!" Aside from guitarist Jason Falkner and bassist Dwayne Moore, who flanked Beck, the remaining band members stood high in a line on a riser, themselves a visual in front of and atop vivid and ever-changing video screens. Keyboardist Roger Manning occupied the left side, with a backing instrumentalist/vocalist trio Beck referred to as "The B-53s" moving in time in the center, and drummer Chris Coleman on the right. The formation was a pleasing departure from the norm that allowed for a great view of all band members throughout the show. As expected, the set was heavily fueled by songs from "Colors," starting with the title track, which, paired with trippy, groovy "Wow," turned the Fox into an all-out dance party. Beck noted that he "spent a lot of years on this record," energized by the reception of fans during the shows from his "Morning Phase" tour. Other highlights from the album included its two upbeat singles "Dreams" and "Up All Night" that both had the crowd getting down from the floor to the rafters. Manning's bouncy keys took the spotlight on vibrant "Dear Life," which Beck introduced as "kind of a letter to myself." That melded into rager "I'm So Free," with Beck back on the electric guitar as green lasers shot across the top of the crowd. He didn't forget his old school fans hoping for some deeper cuts. "Can we take this a little bit higher?" he asked before launching into super funky "Mixed Bizness" from 1999's "Midnight Vultures," Moore's bass driving the heavy groove. Further revisiting that album, the band departed the stage, leaving Beck alone to play a solo acoustic version of fan favorite "Debra" that morphed stunningly into a partial cover of Prince's "Raspberry Beret." Those who appreciate Beck's softer side delighted at a stripped down mini acoustic set featuring mandolin, banjos and even a dulcimer. The band dazzled with impeccable harmonies on "Lost Cause" before spotlighting two songs from epic "Morning Phase," including the aching melancholy of "Say Goodbye" followed by "Blue Moon." To fans' delight, Beck closed out the main set with two hard-hitting classics starting with "Loser," the song that made him a star, sounding just as fresh and relevant now as it did 24 years ago. He ended with fuzzy, gritty "E-Pro," the opening track from his 2005 album "Guero." Leaving no hit un-played, after a quick respite, Beck reemerged in a fresh white blazer to begin "Where It's At" (with a brief tease of "Strawberry Fields"). Midway through the song, he paused, saying, "We're going to slow it down a moment. There's just too much going on in the world. You know what this world needs? A little dead space. I'm going to put a little dead space right in this song." He stood looking up silently before moving into a highly entertaining band introduction segment. After formally introducing every member, he indulged each a brief solo of another band's song. Bassist Moore kicked it off with a slice of Chic's party anthem "Good Times." Falkner followed suit with a few licks of "Miss You" by The Rolling Stones. Manning lent his keys to several bars of New Order's synth-pop classic "Blue Monday," and the trio Beck introduced as "The B-53s" led the band through the chorus of Talking Heads' "Once in a Lifetime" before Coleman rocked a solo on the drums. After the fun if lengthy diversion, they resumed "Where It's At," Beck calling out "Stomp your feet and clap your hands," and the audience obliging as the band gathered at the front of the stage dancing in sync. He gave one last St. Louis "shout out," injecting a few bars of Nelly's hit "Hot in Here," before the group glided offstage as one, leaving the crowd in a state of elation and awe. From start to finish, the show felt like one enormous piece of performance art – a dynamic, sensory experience that both looked and sounded amazing in the acoustically ideal Fox Theatre. Beck continues to prove himself as one of music's most creative and distinctive talents. Show openers The Voidz, the current band of The Strokes' former front man Julian Casablancas, felt far less cohesive, unleashing a chaotic and unsettling blend of genres and styles that didn't necessarily work to make them stand out in any one area. Their sound mix was painfully loud and abrasive (particularly the bass, which at times shook everything in earshot to the core). While Casablacas' distinctive voice remains intriguing, it seemed lost in the outright noise. Nevertheless, the band drew its fans up close to the stage into a mini mosh pit of sorts that at least some seemed to enjoy. The highlight of their set may have been Casablancas' hat-tip to the theatre itself, calling it the "most beautiful venue we've ever played" – a fact that at least most of the audience could agree with. Beck performs at The Fabulous Fox Theatre, September 16, 2018. Photos by Karl Beck. Check out the full set of photos on the KDHX Flickr page.